With increased use of and reliance on technology, threats to cybersecurity present a growing and serious challenge for the public and private sectors. The passage of legislation such as the Health Information Technology for Economic and Clinical Health Act encourages expanded use of health information technology, which introduces an increased need to protect health information, public health infrastructure, and improved resilience to cyber-attacks. 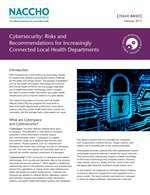 This issue brief provides an introduction to cybersecurity and offers recommendations for local health departments to improve their cybersecurity practices.